Can I revive a friend, once he becomes a ghost? I'm playing Spelunky on Xbox with my girlfriend. When one of us dies, he/she changes to a ghost. Is there a way to change this ghost back to life? We tried carrying the dead body to the exit door, but it didn't do anything. I know of at least one way: if you can find a coffin -- the kind that normally holds unlockable characters in a single-player game -- it will bring a dead player back to life. If multiple players are dead, the one that has been dead the longest will be brought back. 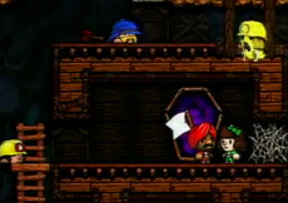 What is the difference between Spelunky and Spelunky HD? When should I start sacrificing women at the altar? How do I steal from a shopkeeper?